Last year at FFL I attended every emotionally beneficial (to me) session. Each night, talking to my friends, they would tell me about FDA this, or Bionic Pancreas that, or basal/bolus solutions and I was all “I talked to people.” Don’t get me wrong, I loved it. But I wanted to learn this year. I wanted my head to hurt from the knowledge, and let me tell you, it does. You wear 2 pumps and a CGM. One is filled with insulin and one glucagon. The participants could do anything without worrying. Exercise, food, etc. They were encouraged, if not required to eat a high fat/high carb diet. These are foods that are the hardest to work with, so how would we know if it’s actually working if we ate the perfect diet. From the first moment I stepped into the room, I was captivated. 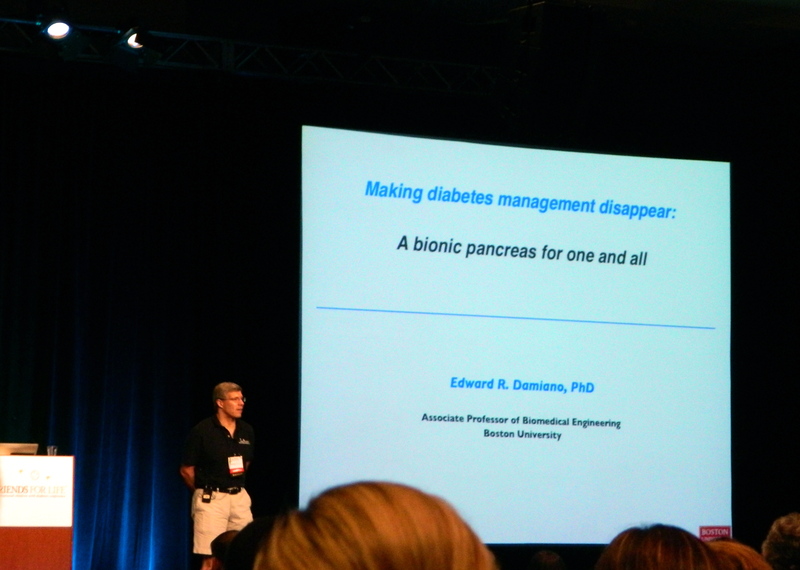 Not only is Ed Damiano a brilliant researcher/developer, but he also is a powerful presenter. I tried to take as many notes as possible, and hopefully I can summarize this for you as well. This is not a cure. Read that on repeat. This. Is. Not. A. Cure. It’s a tool; it is a far superior tool to what we have now, but it is just a tool. The algorithm needs to know how to adapt to changes within the body, such as sickness. 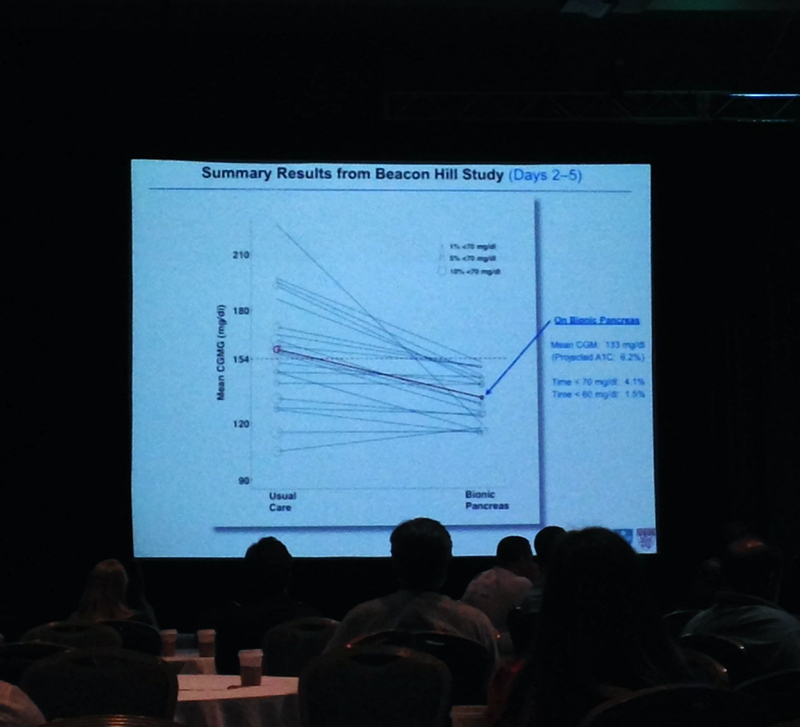 This is one of the only systems which doesn’t need to know about a patient’s current insulin therapy program. It only needs to know a person’s weight. The current iPhone device will only be used through the trials, it will not be a part of the final product. Is this system waterproof? Based on how it seems to work, it would never come off, so I assume yes. Can’t assume. How will this bode for my scar tissue? I know that Ed isn’t thinking about me specifically, but I know I’m not the only one with this issue, and is there a way to get around it? I’ve seen Dr. Damiano speak a few times now, but your write-up reveals some new things I hadn’t heard about before. Bummer about the money. If you send me the info, I’ll see if I can scrape something together. 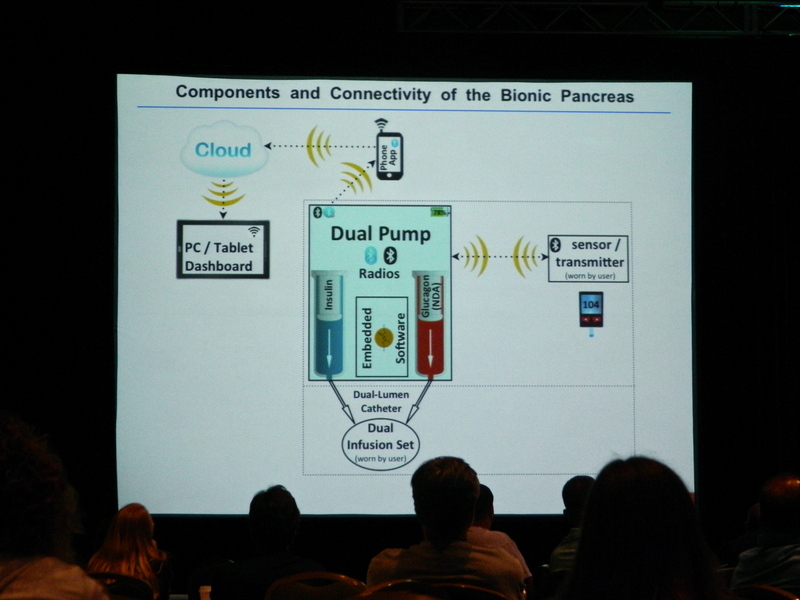 I wished that I had remembered to ask about the glucagon component—even if I can’t get my hands on a bionic panc. in 2017, I’d love a vial (or two or 3) of pre-mixed, shelf-stable glucagon! I loved this presentation too. Thanks! This is the report I’ve been waiting to hear about from FFL. Please send me info on how to donate. I thought with the Helmsley Trust that they were good to go but maybe not. Hopefully JDRF is all over this.